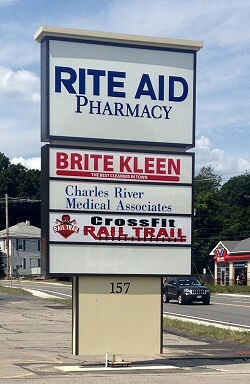 The busiest part of the rail trail has always been the Rite Aid parking lot on Rt-85 in Hudson. The small commercial strip mall has 3-6 stores and designated parking for the trail. For several years the fancy back-lit sign out front has had a couple of empty sections as tenants came and went. I’ve always fantasized that we could get the landlord to put up the ARRT logo and name, as an extra fancy way of announcing the trail. So I thought I was hallucinating last week when I drove past the mall and thought I saw our name in the 4th spot! But the reality was even better, as Hudson now has the “CrossFit Rail Trail” fitness center in one of the buildings, right next to the trail. A few days later I stopped by and got a tour of the facility with PJ Massey, one of the owners. He choose the name to help make it unique and because of its proximity to the trail. 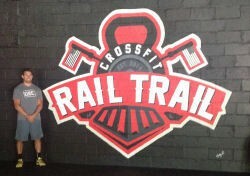 CrossFit Rail Trail is a 4,000 sq. ft. fitness facility designed to provide a quality CrossFit experience. At CFRT you will not find typical gym equipment like treadmills, ellipticals or nautilus machines. Upon entering through one of our 5 garage doors you will find a wide open space filled with pull ups bars, kettlebells, medicine balls, plyo boxes, Olympic bars and more. There is plenty of parking in front or behind our space where on any given day may find our team tossing a football, shooting hoops or engaging in a game of whiffleball homerun derby! Best of luck to PJ and Mike. Welcome to the neighborhood! Tom Kelleher is the president of the Assabet River Rail Trail 501(3)(c) non-profit and a 25-year resident of Acton MA. This entry was posted in Uncategorized and tagged CrossFit. Bookmark the permalink. AssabetRiverRailTrai… on The bids are in! Linda Giovinazzo on The bids are in!